Instagram announced Tuesday it will now let users share "Stories," a feature it copied from Snapchat in 2016, to friends directly. Snapchat unveiled a similar feature in March that lets you create custom stories for groups. Instagram says the update will be rolling out globally over the coming weeks. 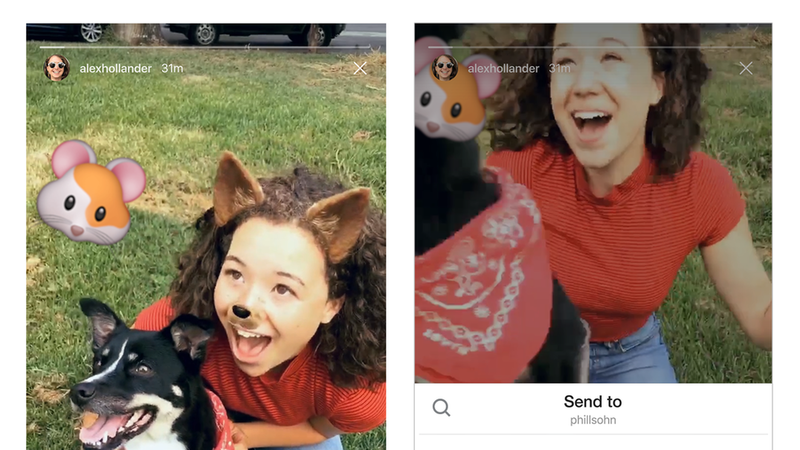 Why it matters: Instagram has captured a massive Stories audience since it launched the copycat feature last year, and most analysts would argue that it has put a dent in Snapchat's user growth. In June, Instagram Stories hit 250 million daily active users (DAUs), again surpassing Snapchat's 166 million DAUs, first reported during its earning's report in May. Its efforts appear to be paying off. Instagram surpassed Snapchat's number of daily active users less than a year after launching its Stories feature. "We've acknowledged over and over again that we did not invent the Stories format," Levine said. "It's a great format and it works well in our community."